It seems like ever since I announced that I was pregnant, all my blog entries have been focused on complaining. While it certainly has been no walk in the park, it’s not all bad, and I realize that there are plenty of people out there in situations much worse off than mine. The past weekend, Rob was gone for a cycling training camp, and to keep me from being too lonely, my parents (Rick and Nan) came for a brief visit on Saturday. My mom even went with me to this month’s neighborhood coffee, and she got to meet all the ladies of Vermont Avenue. I think she was duly impressed with them. My being pregnant is kind of a big deal on this block—most of the women are in their 60’s or older, so it’s been a long time since any of the neighbors were pregnant, and everybody is excited for me. I love hearing all the ladies tell their stories of their own pregnancies, their children, their grandchildren. Many of these women have had amazing careers as well—in a time when being a working mother was comparatively rare across the country. It’s really pretty inspiring for me to spend a morning with the ladies on my block. In addition to getting to show off my mother at the party, I also found myself brave enough to try a little decaf coffee—for the first time since Christmas. Coffee has been one of those things that the sight of, smell of, even the thought of, makes me feel like I’m going to wretch. The coffee I had on Saturday didn’t taste quite like it did to me in my pre-pregnancy days (most things haven’t tasted quite right since Fig has been present), but it was still really comforting to try it again. 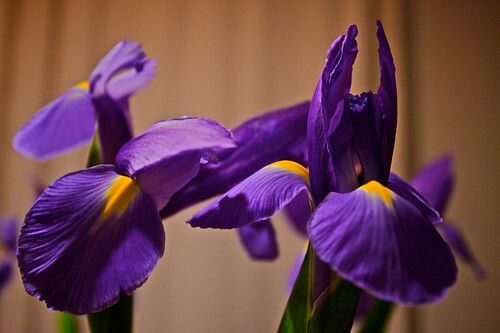 My mom and dad brought me a bouquet of irises, my favorite flowers. The next morning—when I awoke to snow on the ground—it was nice to see the flowers while snow swirled outside. I’m not sure if one semi-happy post can counteract all the nausea-induced gloom and doom posts I’ve been writing, but at least it’s a start. Hopefully there are more to come. Thanks for reading. I remember with my first pregancy, I never knew I was feeling the movement of my baby either. After you realize what it is, you kinda just wait for it to happen again. It is GOOD to hear that you must be feeling 'somewhat' better? The flowers looked beautiful, and how sweet of you to visit with older women and actually enjoy it. It gives us all hope, that we are not to boring!!! Good luck as you forge on through your pregancy. We are all waiting anxiously to meet fig. I think I need to proofread my blogs. I REALLY do know how to spell pregnancy??????? THAT IS RIGHT, ISN'T IT?????????????? It certainly sounds like the ole Melissa is on her way back...Keep it up Fig! If that's what makes your mom smile then keep kicking her!